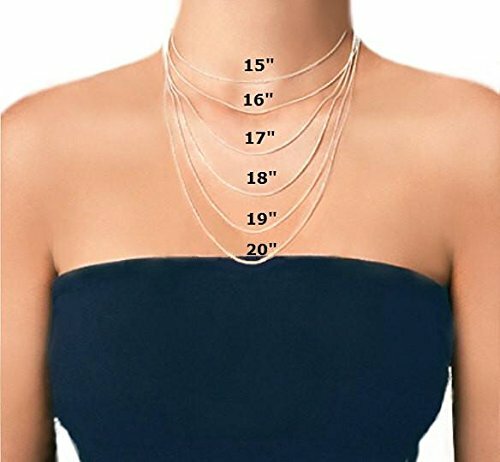 Dimension: 19" x 1.5" x 0.7"
This necklace flaunts THC molecular structure- Our THC necklace for women has a THC molecule pendant hanging from a like-colored 19" chain. THC releases dopamine in the brain, which causes euphoria. 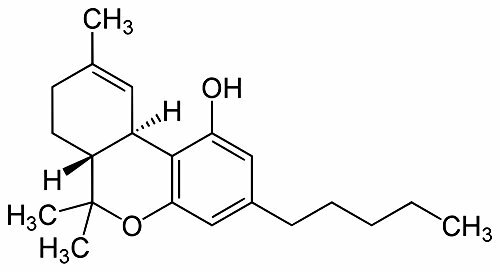 This chemical is responsible for THC's high and its migraine, pain, nausea, and depression-relieving qualities. This geek statement necklace comes in carbon black, gold tone, rose gold tone, or silver tone. 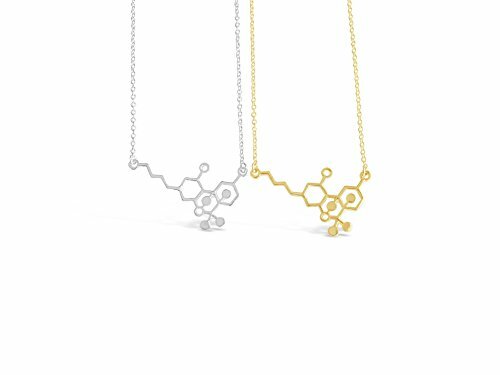 Rosa Vila's THC molecule necklace is a fun geek gift- Test your science-loving friends' true knowledge by gifting them this THC molecule jewelry piece-just don't tell them what molecule it is. See how long they wear it before realizing what it is. Or, wear it yourself and see if your parents ever figure it out. 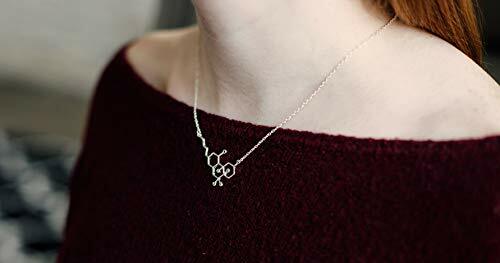 Either way, these nerdy necklaces make great edgy accessories for chemistry students and fans. Our THC necklace is a fun gift for anyone who likes to use CBD oil, hemp oil, or eat hemp seeds. 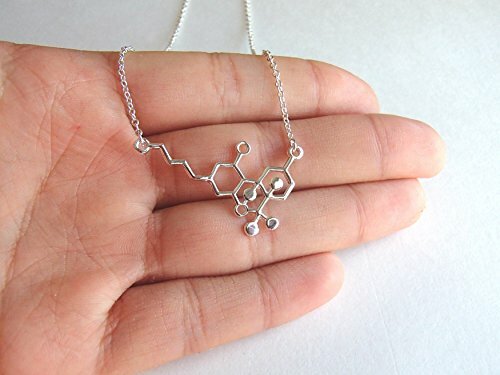 If you know someone who likes to use these natural oils, help them honor the plant with our THC molecule necklace. THC chemical necklace in carbon black, rose gold, gold, or silver tone, 19" chain Our THC pendant necklace offers a more work-appropriate way to show your appreciation for THC or medical CBD. 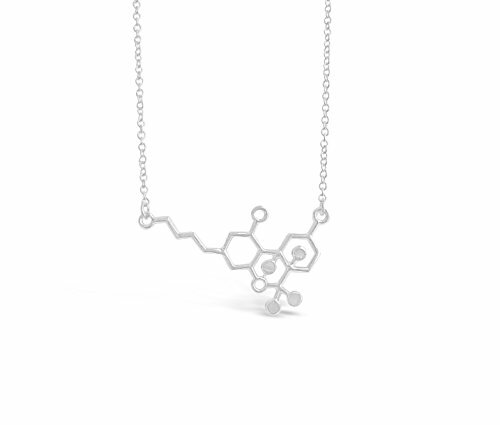 We turned the chemical structure of THC into a pendant, which hangs from a like-colored 19" chain. It comes available in carbon black or gold, silver, or rose gold tone. 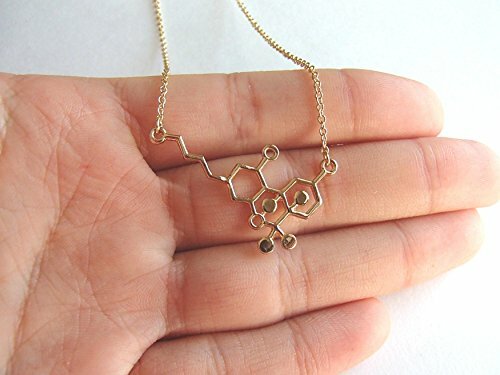 No matter what color it's in, this necklace will get conversations going as people question what chemistry molecule jewelry piece you're wearing. Whether or not you tell them is up to you! You might see it as an opportunity to express your thoughts on medical THC and its purpose in your life. THC, found in hemp plants, causes positive psychological effects like migraine, pain, inflammation, or depression relief. It even positively effects your brain cells when used properly. 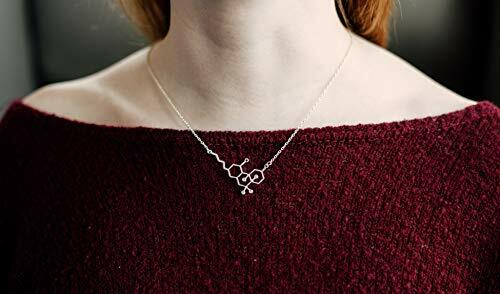 Plus, it makes a unique piece of geek jewelry for women that pairs with any outfit. Our jewelry is inspired by the thoughts, feelings, and objects of everyday life. We take these ideas and transform them into meaningful, delicate pieces of jewelry. Rosa Vila also likes doing its part to protect the environment, so we package all of our jewelry using eco-friendly, recyclable materials.